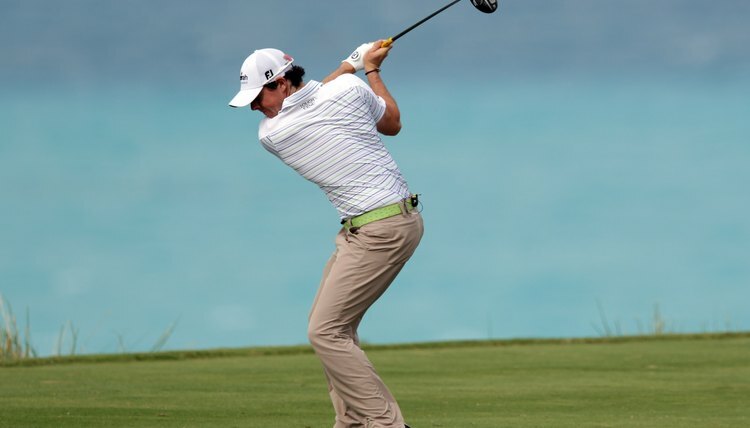 Northern Ireland's Rory McIlroy makes a strong move on the left side of his body to generate a more powerful golf swing. One of the keys to lowering scores on the course is leaving close approach shots to the green. A technically sound left shoulder turn (for right-handers) will help golfers add more power and distance to their swings off the tee. Several drills exist to help golfers improve their shoulder turns and add more distance. Sometimes golfers make the mistake of leaning instead of shifting their weight during the golf swing. Golfers who struggle with increasing power on their left side should work on making a controlled weight shift during the golf swing. When making a golf swing, golfers should focus on turning their body on the backswing. This will help transfer weight and allow for a more-powerful downswing. To practice, hold a golf club tight across your chest with both hands, then make a swing. The club should rotate with you as you turn, reinforcing the feeling of a proper weight shift. Visualization of the turn in the golf swing can help golfers make a better turn to their left side with more force. To test this, right-handers should line up in a hallway with a wall on their right. Put your right hand on your right hip, so that the elbow touches the wall on the right. Press the palms together and bring them back in a backswing. When you get to the point where you reach the wall, place both palms on the wall. Notice how the chest has turned and is facing the wall. If you haven’t transferred the weight properly, the chest will still be facing down where the ball would be. Practice this drill at home to get a better feeling for the body turn. When swinging the golf club, the left shoulder (for right-handers) should serve as a focal point for the body as the club rotates through the swing. Think of three triangles at various points in the swing. During the backswing, the club, shoulders and body make one triangle. On the downswing, the right shoulder connects with the end of the club and the hands to make another triangle. Halfway down the backswing, the left shoulder connects to the hands and the club to make the third triangle. These three triangles help ensure a proper transfer of power to the downswing and follow-through.